As tax season is upon us, we wanted to again highlight why many investors find municipal bonds a valuable addition to their portfolios. As individuals work through their 2018 tax return filing process, many may be shocked to find they have a tax bill to pay for 2018 when they may not have in the past. In addition to the expected pick-up in demand for munis, we also continue to see a decrease in supply in the market. Many investors flock to municipal bonds because of potential tax advantages. While this year's taxes are probably already done and dusted, Franklin Templeton's municipal bond team felt it was an appropriate time to revisit the opportunities and risks that recent US tax reform poses for the space. Sheila Amoroso and Christopher Sperry discuss how constrained supply is impacting the market. As tax season is upon us, we wanted to again highlight why many investors find municipal bonds a valuable addition to their portfolios. In addition, we also wanted to revisit some of the points we made late last year about the opportunities and risks as the effects of US tax reform are felt in its first full year since passage in 2017. As individuals work through their 2018 tax return filing process, many may be shocked to find they have a tax bill to pay for 2018 when they may not have in the past. This may largely be due to the fact that state and local tax (SALT) deductions - which were not capped previously - are now limited to a maximum of $10,000. While the marginal tax rates did decline under the new rules, taxpayers from higher-tax states, including states with higher property tax rates, may have been adversely affected. Many impacted investors may be looking for a more tax-advantaged investment to maximize after-tax returns. Municipal bonds look to be a primary choice for those investors. Already this year, the industry has seen more than $24 billion in net muni inflows1- the strongest demand to start a year since 1992. As mentioned, there have been opportunities but also risks as a result of the new tax rules' impact on the municipal bond market. In addition to the expected pick-up in demand for munis, we also continue to see a decrease in supply in the market. While 2019 has started with healthier supply on a YoY basis, it remains to be seen how the rest of the year will fare. We do feel, however, that forward-looking supply should be less than the average levels we have seen in the years prior to tax reform. One area of concern for us is the fact that issuers have been looking toward shorter non-call periods for their issuances to help manage liability profiles, now that advance refunding of issues is no longer allowed. This dynamic is important to analyze as the bonds may behave differently than investors expect because of these unique structures. One area of opportunity we continue to see relates to the alternative minimum tax (AMT). As the name suggests, AMT is a backup method of calculating federal income tax used to ensure that high-income households and corporations pay their fair share of taxes. Under the law, certain tax benefits such as exemptions can significantly reduce a taxpayer's regular tax liability. The AMT applies to taxpayers with high income by setting a limit on those benefits to preclude a situation in which a wealthy taxpayer would end up owing nothing. AMT helps to ensure that those taxpayers pay at least a minimum amount of tax. The Tax Cuts and Job Act of 2017 (TCJA) completely repealed the AMT for corporate taxpayers and significantly reduced the number of individuals subject to the tax. Because fewer people will now be subject to the AMT, we have found opportunities in AMT issues from credits we like that are providing an income advantage over similarly rated non-AMT exposures. While we have historically had a more defensive posturing with regard to AMT exposures in our portfolios given the large number of clients exposed to the tax, now that the overall client exposure to AMT is reduced, we can be a bit more aggressive in purchasing AMT exposures that we are comfortable with. Private activity bonds are tax-exempt and typically issued by or on behalf of municipal or state governments to finance certain qualified projects. These projects are private-user projects for a public good: for example, airports, parking facilities and similar projects. Some of these bonds are taxable for bondholders subject to the AMT. These AMT bonds have traditionally been offered at a higher yield compared to non-taxable municipal issues to compensate for the tax liability to some investors. Since the number of AMT taxpayers has declined as a result of the TCJA, we expected the demand for AMT munis to increase. Interestingly, we have not seen a significant spread tightening between AMT and non-AMT issues in the market, which creates an investment opportunity. Utilizing our deep and experienced team of muni investment professionals, we strive to take advantage of potential opportunities in the market and pass the extra tax-free income on to our clients. In our view, municipal bonds can be a great source of tax-free income for many investors. With an active approach, we believe investors can take advantage of potential market opportunities while also striving to avoid potential risks. Data from third party sources may have been used in the preparation of this material and Franklin Templeton ("FT") has not independently verified, validated or audited such data. FTI accepts no liability whatsoever for any loss arising from use of this information and reliance upon the comments, opinions and analyses in the material is at the sole discretion of the user. All investments involve risks, including possible loss of principal. Because municipal bonds are sensitive to interest-rate movements, a fund's yield and share price will fluctuate with market conditions. Bond prices generally move in the opposite direction of interest rates. Thus, as prices of bonds in a fund adjust to a rise in interest rates, the fund's share price may decline. To the extent a fund focuses its investments in a single state or territory, it is subject to greater risk of adverse economic and regulatory changes in that state or territory than a geographically diversified fund. Changes in the credit rating of a bond, or in the credit rating or financial strength of a bond's issuer, insurer or guarantor, may affect the bond's value. A fund may invest a significant part of its assets in municipal securities that finance similar types of projects, such as utilities, hospitals, higher education and transportation. A change that affects one project would likely affect all similar projects, thereby increasing market risk. Investments in lower-rated bonds include higher risk of default and loss of principal. For investors subject to the alternative minimum tax, a small portion of municipal bond fund dividends may be taxable. Distributions of capital gains are generally taxable. Federal and state laws and regulations are complex and subject to change, which can materially impact your results. Always consult your own independent financial professional, attorney or tax advisor for advice regarding your specific goals and individual situation. Investors should carefully consider a fund's investment goals, risks, charges, and expenses before investing. To obtain a summary prospectus and/or prospectus, which contains this and other information, talk to your financial advisor, call us at (800) DIAL BEN/342-5236, or visit franklintempleton.com. Please carefully read a prospectus before you invest or send money. 1. Source: Investment Company Institute, through March 20, 2019. 2. Source: Bond Buyer, December 31, 2017. 3. Sources: Bond Buyer, Thomson Reuters, "December Downfall: Municipal Issuance Plunges 68%," December 31, 2018. 4. 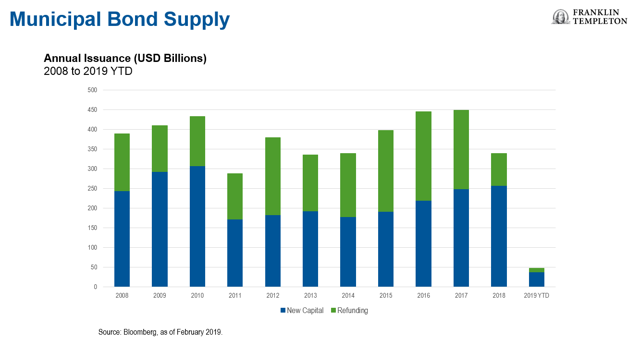 Source: SIFMA, Municipal Bond Credit Report for the fourth quarter and full year 2018, February 2019. 5. Source: Moody's Investors Service, "US Municipal Bond Default Rates and Recoveries, 1970-2016."